Sir Arik was a true gentleman, intelligent and easy to handle, but knew his job with the ladies. We had two of his True Black daughters on our farm, out of black dams, and a friendly light fawn male (Romeo) out of a fawn dam. Arik produced either rose gray or black offspring in most matings, and mostly female crias. He had a great temperament, solid bone, a perfect bite - just a joy to have on the farm. We thought enough of Sir Arik that we showed him in halter at almost 14 years old under judge Kathy Klay at the 2014 Michigan Spring Breeders Show! Arik earned a blue ribbon and a glowing commentary by the judge saying "this is the type of male that is the future of our industry". She went on to explain about the importance of consistency in fiber diameter, that she expected to see guard hair on the belly and legs, which she could see on Arik. But that guard hair in his blanket was not evident - not that he didn't have guard hair in the blanket, but that it is so fine as to blend with the secondary fibers making for a very consistent, high quality fleece throughout. All that aside, Arik was one of those rare males that continued to regrow fleece in fine, low micron, soft handle, lovely rose gray. Even at over 17 he was dense, fine and had good staple length, bright, soft handling fleece! His daughter, Black Mercedes, had a micron of 17 in true black. Bred to a brown female with vicuna markings, he reproduced himself in a rose gray as seen in the pic of his 2013 son Sir Anthony taken April 10, 2014. Sir Anthony, owned by Annette Taylor, earned the blue ribbon at his first show with competition in his class. 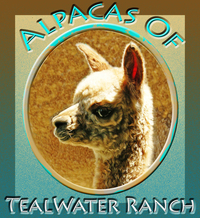 Annette repeated the breeding and got a matching gray female cria! Arik was a real special male and a farm favorite. We bred him to our best black, Res. Ch. Tealwater's Black Pearls on 8/26/16 and were blessed with a stunning fawn male born on 8/21/17 - the day of America's Total Eclipse. 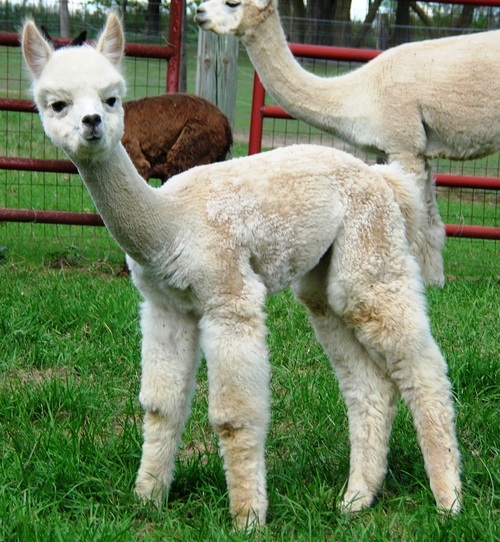 At two weeks old this friendly, perfectly balanced cria was almost 24 lbs. 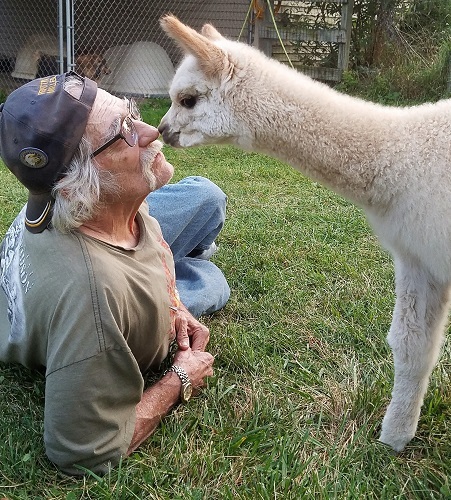 Sir Arik, who was dying of old age over Labor Day Weekend got to spend his last day cushed in the sun in our back yard, looking out at the moms and crias he watched over so faithfully throughout his life. He is buried on our farm. Calm female, very good mother, very dense, soft fiber with good staple length. Has well known full Peruvian bloodlines, including 6Peruvian Accoyo Plantel. 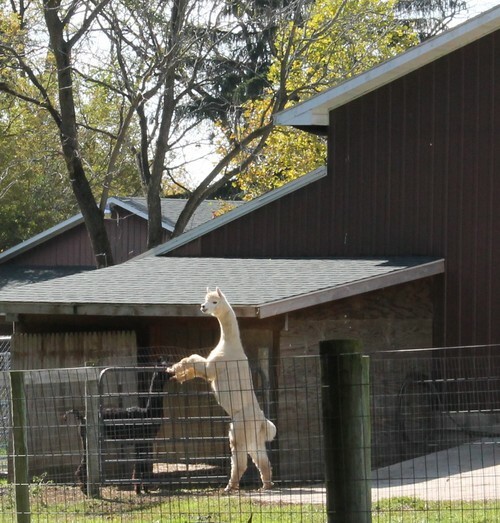 Romeo does give kisses, and has a habit of standing on his hind legs to get a better view of things - he is quite entertaining and produces a large volume fleece of average fineness, approximately grade 3. We blended his clip this year with the locks from our oldest suri, Appollo, to produce a nice lustrous, soft handle batt for spinning or felting. It spins beautifully. 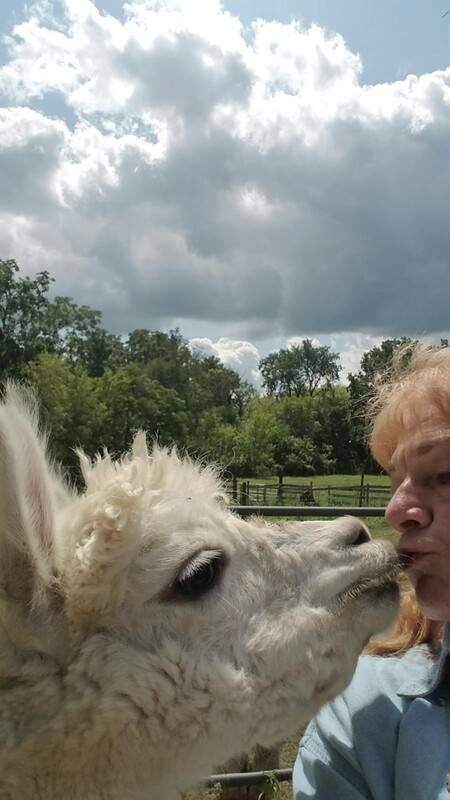 Romeo likes attention and would do well with 4-H or someone looking for an alpaca to train for obstacle course competitions - he is quite intelligent and we often use him as a pen animal to greet the public - have ever since he was a cria.